As you add condiments to your burgers, hot dogs, etc. at a summer barbecue, take a minute to reflect on where they come from. Most are plant products. And a recent study published in PNAS tells the story about how humans wound up with mustard. Let’s dive in to the story of fierce competition, evolutionary niches, and how change can be tracked in DNA. Evolution has shaped life on Earth since it began. As life got going, it started to fill new niches until the Earth teemed with life as it does today (though we may be in the midst of a 6th, human driven mass extinction). Space, time, and other life provide niches for life to fill. Organisms respond to pressures in their environments and to each other as conditions change, resulting in all the different forms of life. And it’s not just the plant-reliant life that I write about most often: life exists in all sorts of seemingly inhospitable conditions like deep ocean vents, deep caves and even within the crust of the Earth. But even there, we have things in common with that extremophile (the general term for life capable of living in extreme– to humans at least– conditions. Some of our DNA, though not a lot, is the same as theirs. The diversification from a single origin means that all life is related. And species that diverged from one another more recently than a third species are more closely related to one another. A pioneering species can find a new niche to occupy by developing an evolutionary innovation. Depending on how broad and diverse a niche is, that one pioneer can eventually become many species as geographic barriers, reproductive barriers, and other factors separating populations cause further speciation. This is called a radiation. Flowers are one example of an evolutionary innovation that’s radiated around the globe. Of course, none of this happens in an instant. All of this occurs over millions of years. Life on Earth started around 3 billion years ago. That’s a lot of time for evolutionary change. Species able to take advantage of new niches is one way a radiation can occur. In PNAS this month, an international team of researchers published a study tracking the evolution of an ancient butterfly that learned how to detoxify a plant toxin to open up a new niche in the brassicales order of plants that make the toxin (See reference). It likely started on one specific species within brassicales, and as butterflies were reproductively successful, new populations formed that colonized other species within the brassicales. In plant evolution, a common evolutionary driver is whole genome duplication, where all of the DNA in a genome is doubled. This is a time when duplicate copies of genes can start to change and adopt new functions. Eventually, one group in the brassicales, the brassicaceae, developed novel forms of the toxin causing the number of brassica species to explode in number. The butterflies weren’t done, however. In animals, novel genes arise not as much by whole genome duplications, but individual gene duplications, which can be caused by DNA replication errors. Currently, there are species of butterflies that can use brassicas as a host, ones that have evolved a defense for the latest generation of plant toxins. Figure 1 from Edger et al. 2015 (see references). An alignment of brassicales & butterfly evolution. The dashed vertical lines represent times when novel plant toxins evolved. Note how butterfly species radiate after the novel toxins evolve. The Study is a great illustration of how species respond to one another. In this case, it can be characterized as an arms race. The butterflies develop the ability to detoxify the plant toxin, and even be attracted to it, the plants, after millions of years, evolve new toxins, a subset of butterflies develop a way to detoxify those toxins, and the plant then develops yet more toxins. This is a plant and an insect co-evolving. They are driving each other’s evolution. A famous example of co-evolution is Darwin’s orchid, Angraecum sesquipedale. Darwin was sent an orchid native to Madagascar with an extremely long nectar spur and he predicted that there would be an insect with an extremely long proboscis that would be a pollinator for the orchid. It took awhile, but a species of hawk moth was found that pollinated the species. It is another example of a plant and insect co-evolving and responding to one another. 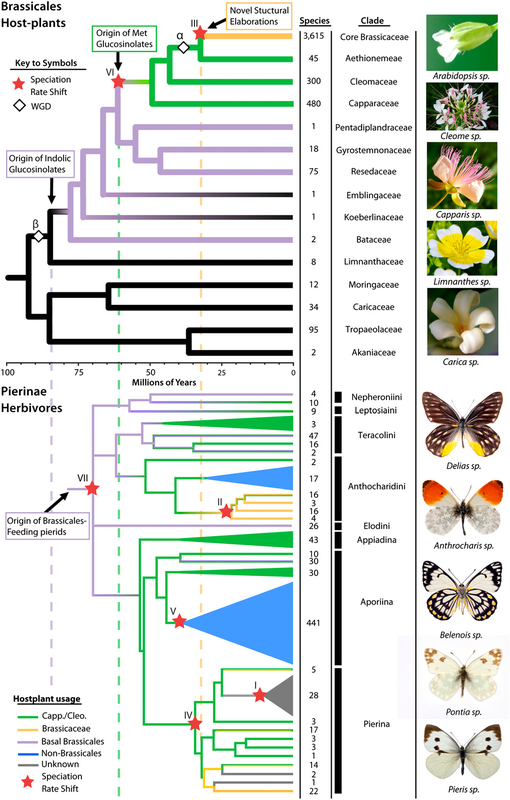 In the PNAS study, they not only affirmed the co-evolution phenomenon, but they were able to track the history of the arms race in the DNA of both the plants and butterflies. Like organisms as a whole, genes in a genome can be selected for. Ones that seems to provide a reproductive benefit to the species are generally preferentially kept in a genome and sometimes increase in copies, other genes are lost over time. These and other kinds of genetic changes ultimately drive speciation to occur. This evolutionary call and response may not sound relevant, but in this case, it turns out this is why mustards have the flavor they do– Wasabi, horseradish, and mustard for instance. The butterfly-plant relationship in the paper is about plant glucosinolates that prevent herbivory and an order of butterflies that figured out how to detoxify the plant’s “keep off” strategy. And we can now track those changes, and even note a group of butterflies that lost the ability to detoxify the brassicaceae (also shown in the PNAS study). Essentially these species found it more advantageous to stick to plants that make fewer types of glucosinolates. Detoxifying plants and the plants producing toxins can be energetically costly. The story of evolution is a push and pull between organisms gaining a reproductive advantage over competitors in a given environment. Changes to DNA over time generate the physical changes in the organisms. Evolution requires diversity and is an example of where learning to be different really is a good thing, at least some of the time.